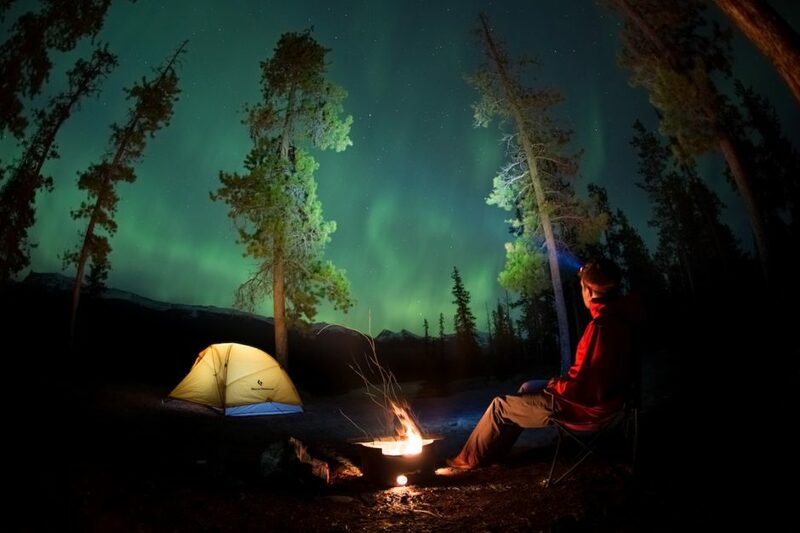 Canada's greatest adventure is waiting in Alberta. Here's proof. THE BIGGEST, WILDEST PARK in the Canadian Rockies, Jasper was made for adventure. It’s home to moose and grizzlies, world-class snowboarders, mountain bikers, and whitewater rafters. And the best way to get here? Via the city of Edmonton. Alberta’s capital isn’t just a gateway, though; it’s a destination in its own right. With a population of over a million people, the most northerly large city on the continent gets cold, yes, but of the 154 days between November and the end of March, 120+ are filled with glorious sunshine. We’re tough up here. We throw axes for fun, barbecue in blizzards, run with dinosaurs, and camp with bison. It’s a year-round adrenaline rush with zip lines, rollercoasters, and wave riding — and that’s exactly how we like it. Need more proof that the Jasper + Edmonton combo is the greatest trip you could have in Canada? Read on. We make the most of summer. 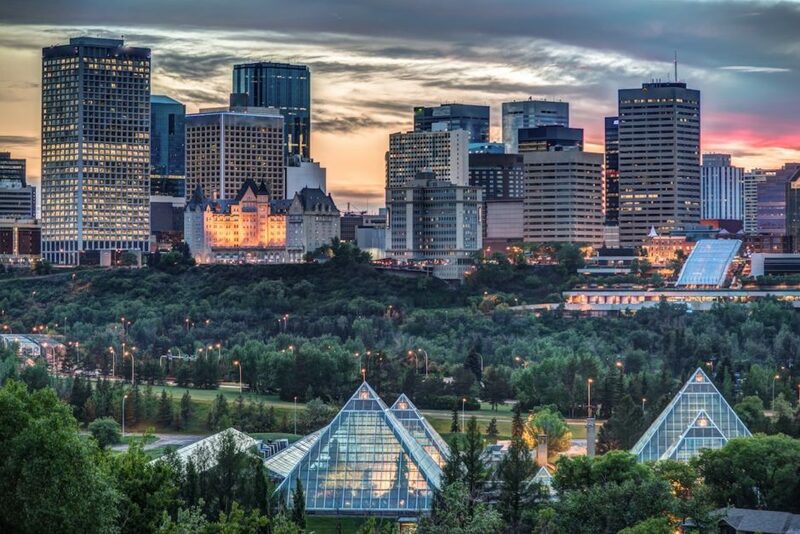 Edmonton is called Festival City for a reason — regardless of when you visit, you’ll see a range of awesome events and festivals on the calendar. Edmontonians are a fun-loving bunch. Anything to do with food, booze, theater, and music brings throngs of people to our parks, patios, and promenades. Porkapalooza, Interstellar Rodeo, the biggest Fringe Theatre Festival in North America; we go freaky over Folk Fest and we’re proud of our Pride Parade that takes place on Whyte Avenue, the major thoroughfare in one of Edmonton’s hottest, hippest districts, Old Strathcona. Whyte Ave is also known for its indie shopping, antique stores, theaters, coffeeshops, pubs, and restaurants that see the area buzz from sunup to sundown. Our flavors stretch way beyond Canada. Old Strathcona is also home to scores of the city’s ethnic restaurants. 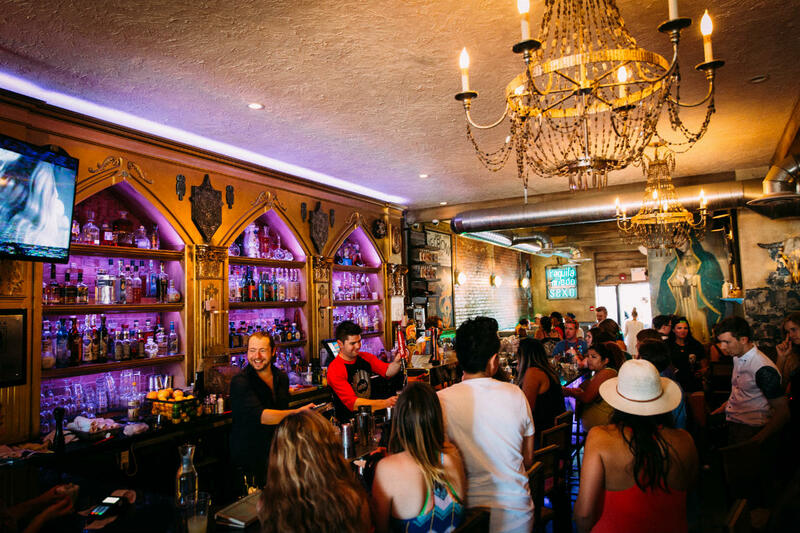 Tequila and tacos are the main attractions at El Cortez Mexican Kitchen. The venue is a snapshot of East LA with in-your-face graphic art, neon signs, and a smattering of religious iconography. The sister space upstairs, Have Mercy, takes you on a trip to the American South — think peeling paint, fried green tomatoes, and honky tonk. Vietnamese sub shops, a Japanese izakaya, Thai, Indian, Korean, and French bistros are all just steps away. We have a smokin’ hot playground. Edmonton’s River Valley is the largest stretch of urban parkland in North America. When we say “Wanna go outside?” it’s not just Fido who gets excited, although there are plenty of areas in the park for dogs to run and roam. For outdoor lovers, winter in the River Valley is all about skiing, sledding, and skating, while spring, summer, and fall are for cyclists, runners, and hikers who take to the 100 miles of groomed pathways. The North Saskatchewan River that meanders through the valley originates west of Edmonton in the Columbia Icefield and winds east to Manitoba, so bring your jet skis, speed boats, kayaks, and canoes, and set sail. If you visit in August, you might even witness a horde of dragon boats screaming down the river at the annual Dragon Boat Festival. Our downtown is seriously cool. So cool, in fact, we’ve got our own Ice District. And the brand new Rogers Place is the jewel in the downtown crown, ready for the Edmonton Oilers’ 2016/2017 NHL season. Concerts, sporting events, and major performances will also take place at the new arena, which is flanked by ultra-modern condos, pubs, and restaurants. The historic 4th Street Promenade is a skip away and full of good places to grab food, like the wildly popular Rostizado, a Mexican restaurant with roasted meats and tequila as its focus. The country’s first neon museum is on 4th Street as well. Looking at the signs at night, you might think you’re in mini-Vegas — hey, we dream big here and we’re proud of it. It’s a well-known fact that we’re good at startups. There’s no stopping us! Why fight it? There’s plenty of fun to be had in winter. Case in point: The Deep Freeze Byzantine Winter Festival kicks off the new year with a gathering of various cultures celebrating the magic of winter. You can eat traditional food, dance to the music, and revel in our northern climate. January also sees professional ice carvers chip and chisel blocks of ice into logic-defying art pieces during the Ice On Whyte festival. You can even pick up an ice carving knife and give it a try…but you’ll want to do that before having a mug of potent hot grog; that stuff packs a punch. 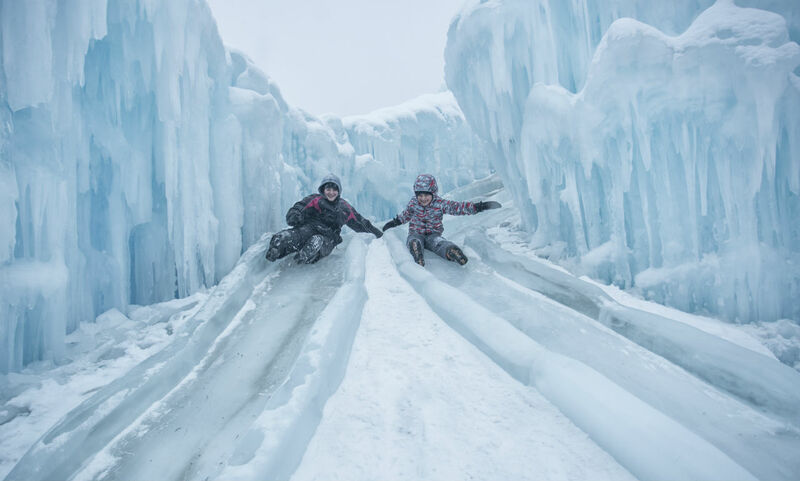 Same goes for a trip down the giant ice slide — make sure you wear snow pants for that one. PS: You haven’t seen an ice castle until you’ve seen our ice castle. It’s part of the massive Silver Skate Festival, held every February, when over 100,000 descend on Hawrelak Park to cheer on the marathon skate racers, party to live music, see fire sculptures burn against the night sky, and maybe even take on the skate trails themselves. Our backyard has mountains, grizzly bears, waterfalls, canyons, and glacier-fed lakes. When you’ve had enough of the bright lights and big city, Jasper National Park is a scenic four-hour drive west past boreal forest thick with aspen and conifers. 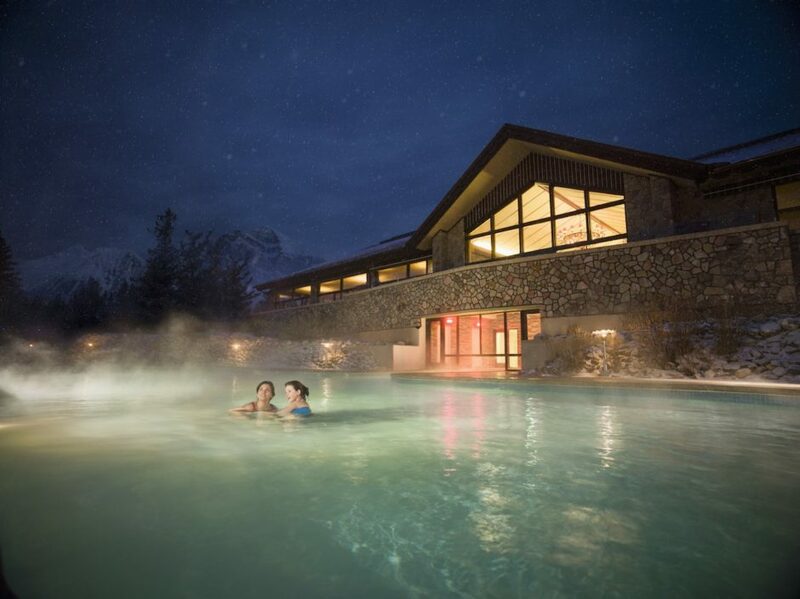 Explore the laid-back town of Jasper and the surrounding park — world-class hiking, mountain biking, canoeing, camping, fishing, and horseback riding are at the ready. The best background shots imaginable are just a bonus. Your Instagram feed is going to blow up. A vehicle gives you the most freedom to venture off and explore, but travel to and from Jasper is also easily available via the SunDog shuttle, as well as by bus or railway. Via Rail offers a return trip from Edmonton, so you can visit Maligne Lake in the summer, or get a combo train ticket/ski pass and transfers and head to Marmot Basin in the winter. Emerald green, turquoise, cobalt blue — the park’s glacier-fed lakes defy description. Put on your hiking shoes, pack a lunch, and get ready for some of the most spectacular water settings in Canada. 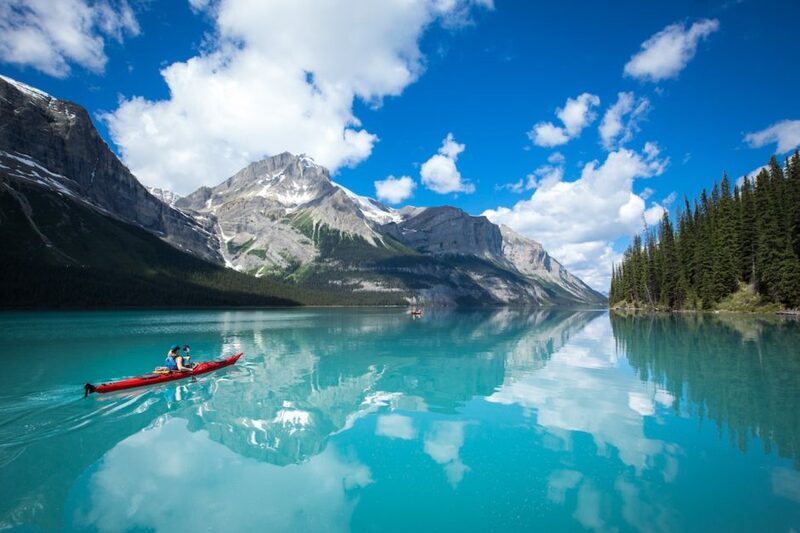 An hour’s drive from town is Maligne Lake — the biggest natural lake in the Canadian Rockies, and maybe the most beautiful — ringed by a crown of peaks, some of them tipped with glaciers. Minutes from town are a handful of other beautiful lakes: Patricia and Pyramid on one side, Edith, Annette, and Beauvert on the other. In fact, there are lakes wherever you go in Jasper; that’s why so many of the park’s hiking trails have cool names, like Valley of the Five Lakes. Hike in, walk around, take a dip, relax. For paddlers: Kayak, canoe, and paddleboat rentals can be found at several lake locations, and in town at Pure Outdoors. 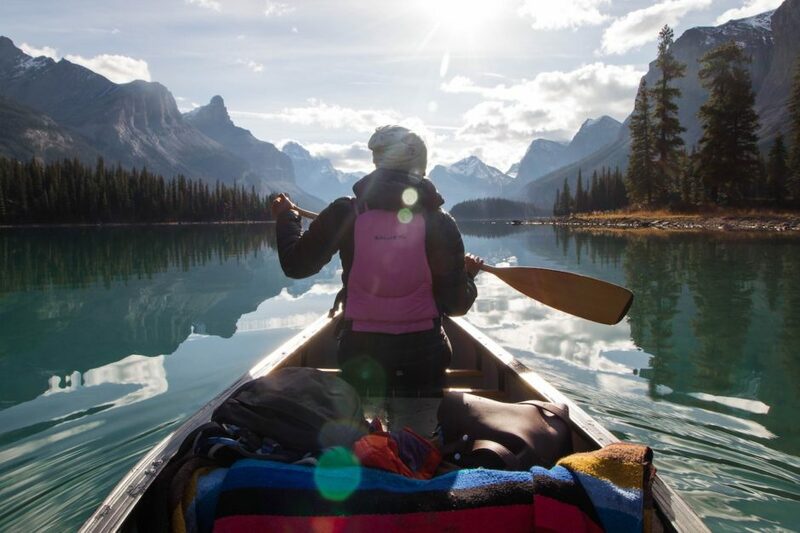 Head out in a beautiful cedar-strip canoe from Wild Current Outfitters, take on the Sunwapta River’s rushing whitewater on a rafting trip, or slow things down with stand-up paddle yoga on Lake Edith — it’s up to you. You don’t have to hike to get incredible views. 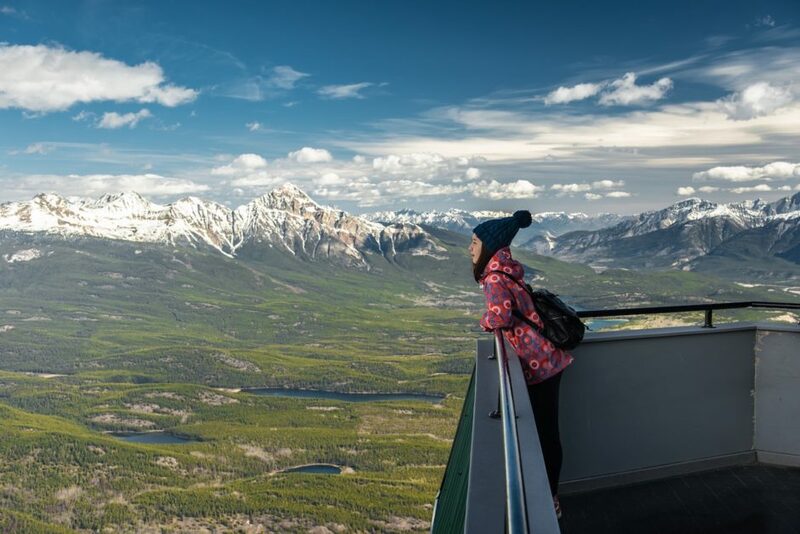 The Jasper SkyTram will take you to the top of the mountain without you even breaking a sweat — unless you’re afraid of heights. If that’s the case, you’ll have to conquer that fear just like the contestants did on season 4 of The Amazing Race Canada. The gondola takes seven minutes to rise to an altitude of 7,472 feet, the views getting increasingly stunning as you climb. A guide in the tram will answer all your questions about the valley below, including everything you ever wondered about the town of Jasper, those lakes that cover every Pantone shade of blue, and the six surrounding mountain ranges. And there’s plenty of luxury options here, too. From the outdoor pool overlooking the lake and the eucalyptus steam room and hot tubs for when you’re done; to the multi-award-winning spa and best golf course in the country; to the restaurants that include Oka Sushi, the small but mighty sushi bar where owner and chef Tatsuhiko Okaki prepares fresh dishes that aren’t just mountain town good, they’re anywhere good (there are only 12 seats here, so reserve in advance). You won’t have to live on trail mix alone. As with anywhere you travel, do as the locals do. In Jasper, townies breakfast at the Athabasca Hotel (known round town as the “Atha B”) and hang out at the Legion (no hats allowed!) for burgers, beer, darts, and live music. You’ll need all that food after a day hiking around the Rocky Mountains. 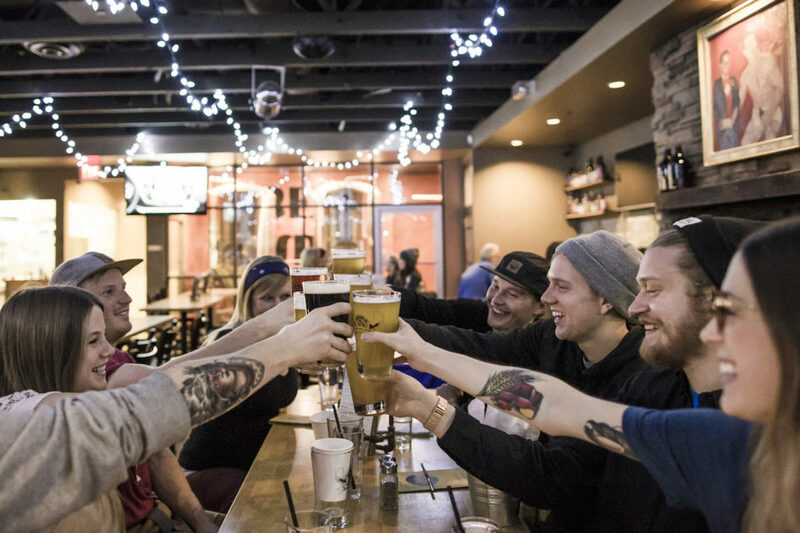 Beer geeks can go right to the source at the Jasper Brewing Company, the first brewery opened in a Canadian national park. You’re going to need a lot of coffee for all that adventure. This town has you covered. Wicked Cup and their latte art is pretty fantastic — think illustrated bears instead of staid hearts or leaves. This spot’s all about freshly roasted organic coffees and teas, excellent breakfasts, and a big patio for hanging out during those sunny mountain days. The scent of fresh laundry and just-brewed coffee might be two of the best aromas on Earth. Jasper combines them at the Coin Clean Laundry, also home to Snowdome Coffee Bar…because what are you going to do while your hiking socks are soaking? Answer: Order a fine cup of Fratello coffee and some home-baked pastries. Around since ‘97, Bear’s Paw Bakery is the pioneer of the Jasper coffee scene. Expect fresh pastries, cheesecakes, breads, strong coffee…and lineups, or try your luck at their second location, The Other Paw, a (very) short walk down Connaught Drive. The night sky has become so bright with urban light that an estimated 85% of Canadians can’t see more than a few stars. Not so in Jasper. This is the largest accessible Dark Sky Preserve on the planet. With 4,250 square miles of undisturbed, inky skies, pick a moonless night and find a spot among the spruce trees on Pyramid Island — a ten-minute drive up the hill from town — to see the Milky Way spiraling above the mountains’ jagged peaks in a cosmic kaleidoscope.